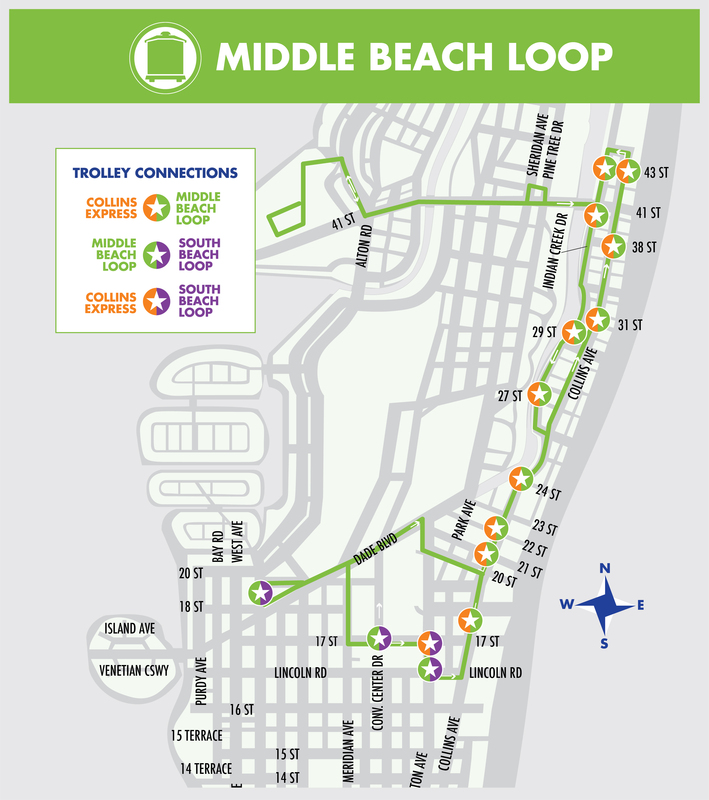 The Middle Beach Loop provides a reliable and frequent service between Mount Sinai Hospital, schools in the vicinity of 41 Street, 41 Street Commercial Corridor, 42 Street Garage, 36 Street Park, Miami Beach Regional Library, Collins Park, Miami Beach Senior High, 21 Street recreational center, Miami Beach Convention Center, Miami Beach Botanical Garden, and City Hall. The Middle Beach loop is an enhanced transit service with ample interior floor space to provide easy access, ambassador style customer service, security cameras, and wheelchair ramps and lifts that will allow easy access of wheelchairs and disabled passengers. Some of the perks of the trolley service include free Wi-Fi on board the vehicles, real-time tracking and next bus information through the city’s mobile application “City of Miami Beach e-Gov” available on Google and Apple app stores. On November 1, 2017, the Middle Beach Loop route was extended to include Dade Boulevard, Alton Road, and 19 Street with an addition of three (3) stops.